My german visa has been denied. Again. For the second time. For the same reason. Despite the arguments by my language school that their requirements are not true, that I'm not required to be held to the standards that they are holding me to because I'm an english teacher in the free market, not a government subsidised german teacher for integration courses for the refugees. I have two job offers, I've been paying into the german insurance system since March, and I have a flat sorted out that is definitely large enough, in a good part of the city, and with two roommates who are both stable and chill. But despite my efforts the visa continues to be denied. I keep getting told no and now, well, now I need to leave the Schengen zone. The reason for that is pretty simple. I was in Germany on a tourist visa, which lasts for 90 days. I was lucky enough to get an extension on that visa since my work visa was being processed, but when I left Germany to go to my job in Switzerland I officially terminated that visa extension. On June 25th my tourist visa officially expired and my Swiss work visa began. As an American I'm allowed to be in the Schengen zone with no problems for 90 out of every 180 days. That math is clear - 3 months in, 3 months out. When I leave Switzerland on August 24th I still have one month left of my 3 month sentence. Fortunately I'm able to come home. I found a dirt cheap flight out of the UK into Chicago, which is pretty much close enough to home, I'll be able to manage from there. My credit card has enough room, barely, for the flight, and hopefully I'll be able to find some work with friends cleaning and babysitting (or teaching flute lessons, what, a girl can dream) in order to pay for the flight back. To be honest though, that's not the heart-wrenching and painful reason. I don't mind that things are complicated. I don't mind that my visa is being denied. I don't mind that I'm spending all of my money, spending all of my time waiting in a nausea-inducing sense of fear. No, this is all okay as long as there is actually a chance that I'll get the visa! I can be patient if I know that X, Y, or Z is happening and that eventually I'll get to start working. But right now I don't have that stability. I don't have anything. Germany was my best chance and it's falling apart. So now here I am, sitting at a Universität in Zürich, frantically applying for jobs (any job) in the hopes that something will work out. Here I am, willing to do anything to get a visa to be able to stay here. I'm not living the dream anymore, this is definitely a living nightmare. Don't get me wrong, I'm sure that my friends and family have seen me posting pictures of when I got to go flying, of hiking Le Dents du Midi, of sitting at the Cabane du Susanfe with my feet up against the wall. But let me tell you a truth about all of this: in Switzerland it's free to hike. The money that I pay to travel to these places to hike or fly or climb is less than I would pay to stay in the city. My fabulous boyfriend has the gear I need when we climb, I own my own pack, my hiking shoes. My body is healthy and I take every chance I can to get out into these mountains because it's beautiful, I don't know how much time I have left here, and I legally can not do any sort of work. At all. No, I'm not just being lazy. No, it's not that I just haven't applied for the jobs. Maybe I just don't want to work at all... NO that's not it either. The problem is one of bureaucracy, paperwork, and a reliance on people who are just as susceptible to having a bad day, a crabby day, or a lazy day at the office, as anyone else. The only difference is my life is in their hands, not just my coffee or meal. This has been the most enlightening experience for me because I never understood what it meant to try to assimilate into a new country. I've never learned firsthand about the trials that you have to go through just to get a job. I had no idea. Even when I went to Korea. Sure there was a lot of paperwork, a lot of unnecessary hoops to jump through, but in the end it was always clear. Do this, do that, finish your checklist and boom you're done. It's not like that here. Everyday I live with the constant uneasy sense of dread that I'm going to either run out of money or run out of time or both. Let me tell you, that's not a good feeling when your boyfriend lives in this country. When the friends you've been cultivating here, the home you have established for yourself here, is all about to be pulled away. I've finished my checklist, on paper I have all of the things that anyone ever said I would need for the job - and the end result is the same: X.
I think the worst thing for me is knowing that I have a Master's degree, that I have an internationally recognized teaching certification, that I have the experience, the willingness, and the drive. That even with all of my hard-work, everything that I have worked to make for myself, I'm scrambling and willing to take even the most demeaning of jobs. 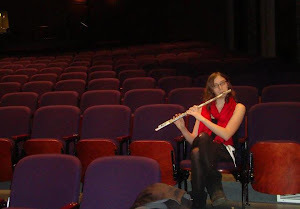 I don't even care anymore, I was a janitor for one summer and I would absolutely do it again if it meant that I could have a stable home, that I could begin playing my flute with regularity again, if I could begin to pursue that which I have trained my entire life for: flute teaching and performance. With every denied visa is a feeling that you are worthless. With every passive aggressive demand for you to get a job already is a feeling that the world thinks you're lazy and undeserving. With every day passed of an interview being stopped short because you don't have a work visa already, or being told not to even bother to come in if you aren't from country X, Y, or Z, or no response at all. Well, it's hard not to start to internalize that negativity. This is the post I've been avoiding. Not because I want the world to believe that my life is rainbows and butterflies, but because I don't want to admit that I'm floundering. I don't want to have to vocalize my fear that I really might not be good enough. My fingers are flying over this keyboard because I've needed to just say it, tell these thoughts, these worries, for a long time, but my mind is hesitant when it comes to hitting that big orange Publish button. Everything that I have is invested in this. The last few years of my life have been leading me here. I have opportunities lined up, schools that I can begin to work with, friends to turn to for advice. I'm so happy here and that makes me feel so sad. For each day that I feel like I'm finally in the right place comes a day where I'm terrified that that place is about to be torn away. I know that someday I'll look back at this time and it won't seem like such a big deal. Someday I can look back on this and smile, knowing that if I can get through feeling like I hit rock bottom (and having the government constantly reaffirming that sensation) that I can really do anything. But damn, it's going to be hard getting out of this one. There, that's what I've been feeling the last few weeks. That's why I haven't been posting about all of the good stuff going on - my mind has been so absorbed with these fears that I can't allow myself to enjoy the thoughts of the good things I've been doing whenever I sit down at the computer. Maybe now I'll be able to enjoy the good things. Maybe now after getting rid of the negative thoughts things will work my way. But who knows. All I can do is put one foot in front of the other.